Unlike Bill Clinton, Barack Obama never tried to say he didn't inhale. In his 1995 memoir "Dreams of My Father," Obama writes about smoking pot almost like Dr. Seuss wrote about eating green eggs and ham. As a high school kid, Obama wrote, he would smoke "in a white classmate's sparkling new van," he would smoke "in the dorm room of some brother" and he would smoke "on the beach with a couple of Hawaiian kids." He would smoke it here and there. He would smoke it anywhere. Now a soon-to-be published biography by David Maraniss entitled "Barack Obama: The Story" gives more detail on Obama's pot-smoking days, complete with testimonials from young Barry Obama's high school buddies, a group that went by the name "the Choom Gang." Choom was slang for smoking marijuana. Maraniss portrays the teenage Obama as not just a pot smoker, but a pot-smoking innovator. "As a member of the Choom Gang," Maraniss writes, "Barry Obama was known for starting a few pot-smoking trends." The first Obama-inspired trend: "Total Absorption" or "TA". "TA was the opposite of Bill Clinton's claim that as a Rhodes scholar at Oxford he smoked dope but never inhaled," explains Maraniss. Here's how it worked: If you exhaled prematurely when you were with the Choom Gang, "you were assessed a penalty and your turn was skipped the next time the joint came around." As one of Obama's old high school buddies tells Maraniss: "Wasting good bud smoke was not tolerated." Another Obama innovation: "Roof Hits." "When they were chooming in a car all the windows had to be rolled up so no smoke blew out and went to waste; when the pot was gone, they tilted their heads back and sucked in the last bit of smoke from the ceiling." Maraniss also says Obama was known for his "Interceptions": "When a joint was making the rounds, he often elbowed his way in, out of turn, shouted 'Intercepted!,' and took an extra hit." Although Obama himself wrote that he and his pot smoking buddies were a "club of disaffection," Maraniss says that's not really true. "In fact, most members of the Choom Gang were decent students and athletes who went on to successful and productive lawyers, writers and businessmen," Maraniss writes. One notable exception was Ray, the group's pot dealer who, known for his ability "to score quality bud," would years later be killed by a scorned gay lover armed with a ball-peen hammer. Obama himself managed to be a pretty good student despite all the pot smoking and unconventional study habits. "He told his Choom Gang mates that the trick was if you put the textbook under your pillow the night before you would perform better on an exam," Maraniss writes. No way, dude! Back to the pot smoking. Hawaii of the early 1970s was something of a pot-smoking Mecca. "It was sold and smoked right there in front of your nose; Maui Wowie, Kauai Electric, Puna Bud, Kona Gold, and other local variations of pakalolo were readily available," writes Maraniss. Obama's pal Mark Bendix had a Volkswagen microbus known as "the Choomwagon." They would often drive up Honolulu's Mount Tantalus where they parked "turned up their stereos playing Aerosmith, Blue Oyster Cult and Stevie Wonder, lit up some 'sweet-sticky Hawaiian buds' and washed it down with 'green bottled beer' (the Choom Gang preferred Heineken, Becks, and St. Pauli Girl). No shouting, no violence, no fights; they even cleaned up their beer bottles." Of course, smoking, drinking and driving on mountain roads could also be a little dangerous. Especially the night they tried drag racing. "On the way down, they saw a figure who appeared to be staggering up the road. It was Barry Obama. What was going on? As they drew closer, they noticed that he was laughing so hard he could barely stand up." His friend had rolled the car. Fortunately, nobody was hurt. And, amazingly, they avoided trouble by leaving the driver alone to deal with the police by claiming it was just an unfortunate "mishap." Maraniss concludes his chapter on Obama's high school years by looking at a note Obama had written in his high school yearbook in a section reserved for students to give a line or two giving thanks to those who helped along the way. Obama had written this: "Thanks Tut [his grandmother], Gramps, Choom Gang, and Ray for all the good times." Maraniss notes: "Ray was the older guy who hung around the Choom Gang, selling them pot. A hippie drug dealer made his acknowledgements; his mother did not." The White House told ABC News that it has no comment. 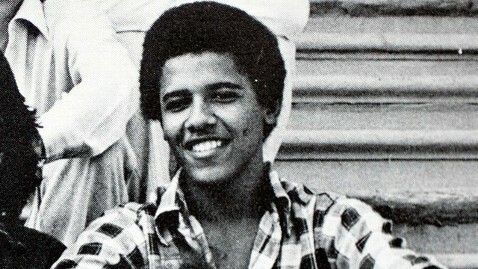 See more photos of Barack Obama as a child and teen HERE.